HAPPY NEW YEAR FRIENDS! I can’t believe it’s already 2017! It’s a new year, and a new month, and you know what that means!? A brand new Stamp of the Month! Check out Januarys adorable stamp, Adore You! I can’t get enough of this script font, and how precious are those flowers? I found myself truly inspired by them, so for this project I reached for our brand new Hello Lovely paper collection! I was able to make this two page spread from the leftovers of the Workshop Your Way kit! I love when I can stretch the leftovers to make even more projects! For these pages, the only thing I added was a couple sheets of Flaxen cardstock for the base pages, and I used a sheet of Fern to make some photo mats. Then I took a scrap of Gold Glitter paper and with our Heart thin cut dies, I cut this little heart to frame where my Nanny had signed their names to the photo. Isn’t that PERFECT!?! She passed away this summer, so I am cherishing every memento I have from her. 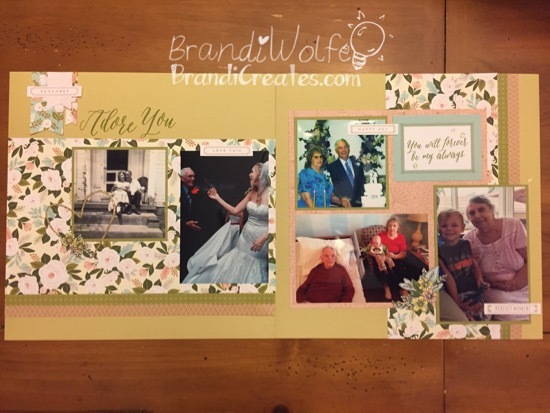 If my layouts have inspired you, you can get your D-size Stamp of the Month at BrandiWolfe.CloseToMyHeart.com Add the stamp set to your cart at checkout for just $5 with a $50 purchase.